What is MEU (Model European Union)? Model EU is an academic simulation of the European Union decision-making process, which aims to educate students about current events and topics in European politics. It is held all over the world by most prestigious universities or non-profit associations that promote understanding of the European integration. 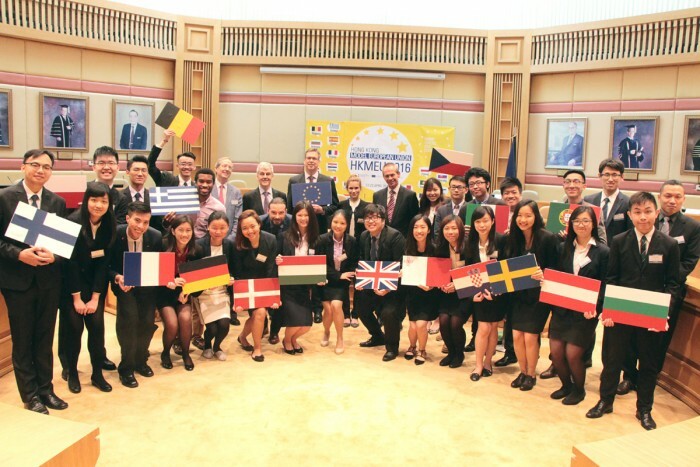 Hong Kong Model European Union is one of the flagship activities under the European Union Academic Programme in Hong Kong. It is unique and first of its kind in Hong Kong. It was held the first time in Hon Kong in 2013 at the Hong Kong Baptist University. As an annual event, its 7th edition took place on 12-13 April, 2019. The Asia-Pa‎cific Model European Union was also being held the first time in Hong Kong in 2016. It brought together elite students from the region to discuss the European migrant crisis in the simulation. For details, click here. Hong Kong Model European Union offers an unprecedented opportunity to learn about the decision-making process in European Union. Participants will not only experience the EU governance mechanisms but also act as Heads of States and/or ministers in order to acquire an in-depth understanding of individual level decision-making. They will be exposed to interactions with diplomats representing European Union in Hong Kong. Finally, through organized seminars and trainings they will learn negotiation and research skills that will enhance their chances of employment in the future. Each EU member state will be represented by two delegates. The winning teams will be presented with ‘Best Delegation Award’ by the committee composed of European diplomats in Hong Kong and faculty staff. Every participant will be presented with a certificate of participation in Hong Kong Model European Union. Additional prizes, if available, will be announced at a later stage.